The following ad popped up on my screen today. In my experience it is usually a bad sign when borrowers start targeting retail investors directly. This is one of those offers that never ends. They'll be back on March 11 with a new one. Didnt Japan do something like this way back when? The most recent example I can think of is GM and Citigroup. I remember them targeting retail investors directly. GM went bankrupt and Citigroups preferred shares went to single digits before the government bailed them out. The Citigroup preffered turned out to be ok but only because of a government bailout. California and Illinois are also paying bills with IOUs. 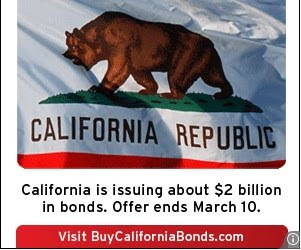 That's worse than selling bonds retail.